It’s a cold February night in Sheffield but there’s a warm glow on the faces of the vast crowd descending on the Hallam FM Arena. For the faithful it’s an opportunity to salute the band that was originally forged together in the Steel City and although they have had to remould the cast they still are probably Sheffield’s most popular export. Mark Zack, a Leppard fan from California gave £5,000 to charity for the privilege of playing one song, “Pour Some Sugar on me”, with the guys at the sound check but will the American get value for his dollar? Well it all went down during the sound check and Joe Elliot immediately tried to make Mark feel at ease. “Well he’s got the right tags on (clothes) He’s looking good, nice strap and guitar, nice leather shirt” Mark Zack was a little nervous to say the least. “This is the ultimate dream, such a feeling, the adrenaline, the passion, everything you ever dreamed of”. Zack took centre stage and Joe shared the Mic with Viv, letting Mark take lead vocals as they went through a once in a life time version of “Pour Some Sugar” After it was over Mark Zack said, “ After the song I told the guys they have made my life”. (Well could have been worse he could have said, “You have laid my wife!) A great ending to a great story and one Mark Zack will be telling the grand kids in years to come. 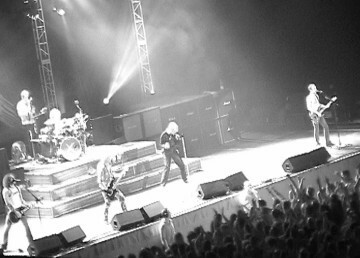 Def Leppard make one fan happy but there’s 10,000 or more hoping to leave the venue buzzing. Let’s see if they do? The lights go down and immediately on cue a row of white lights are flashing in a strobe like fashion on to the crowd who applaud with anticipation of what’s in store. “Let It go” is the opener as the band take their positions on stage like an American Football team, organised, synchronised and ready for touch down. 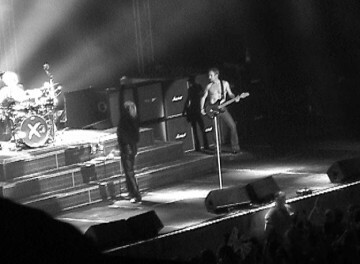 Joe Elliot, dressed in all black lifts the white Mic stand in the air horizontally as though he is donning the flag of honour. The fans eye view of the stage is far left, Vivian Campbell, in a blue sweatshirt with white sleeves, (sort of Arsenal FC but in a sky blue not red centre) Rick Savage, well it’s hard to make out under the flashing lights, it’s sort of a denim bleached kind of camouflage look, Rick Allen at the back on the drums in a dark navy or black plain T shirt, long knee length shorts, Joe centre stage and Phil Collen far right black vest grey bottoms (very Top Man). Up next with out a pause for breath is “Rock Rock ‘Til Ya Drop”. The stage set is basic, just a row of Marshalls, a drum riser and a huge back drop with the letter X in white on it. This song seems much faster than the album version, the band are very tight, as you would expect as they are nearly half way through the UK tour. With so much back catalogue to get through you would have thought they would concentrate on their own songs so their version of The Sweets “Action” is a surprise third choice in the set. Joe finally greets his adoring fans with “It’s great to be back here again” and then lifts the crowd even further by the very mention of going back to 1983 and the Pyromania album. There’s a nice ambience with green lights coming from behind the Marshall stacks but sometimes during the show the strobe lighting (or that effect) racing from left to right just made it difficult to see the band and did little in terms of relation to the music or the band. Joe now briefly explains that they did come here last year and played four songs on what was a pretty diverse bill. This time they are back to tell us about the new album, X and the first song from their recent release is “You’re So Beautiful” which was excellently performed by the band. At this point we have to mention the mix because it was totally over the top drums and guitars. Joe was struggling from the off to be heard above it and with an electronic aided kit there’s no need for so much velocity. The band and Joe got on with the job in hand and “Hysteria” was superb with much more inter play between band members. Savage, leg astride the drum riser was very visual and active on stage. Viv, Sav and Rick Allen are part of a formidable rhythm section but before you could say “Stop The War!" Savage was centre stage with Elliot and the lighting is perfect. The crowd, as though on cue are taking pictures in unison. Flash bulbs flashing around the Arena faster than an air assault on Baghdad. A nice sea of purple lighting illuminates Allen’s drum kit and then the spot light is on Phil Collen as he performs the simple but effect guitar solo. He has taken the majority of the guitar solos and played exceptionally well tonight. The ending to the song was a nice touch finishing with a harmonic from Collen. Joe, keen to take advantage of a more positive audience response takes a shot at promoting the forthcoming single out in a few weeks. “We are going to keep it down a while longer as we have just shot the video to our new single which is out in a few weeks”. “Long Way To Go”, a clean guitar sound, Rick Allen just riding the hi hat, the vocals ring out in the auditorium and the quality of the backing vocals is outstanding. (As it was with hysteria) That’s why we picked up on the mix because this is what the fans pay to hear, a ticket and a pint and there’s not much change left from £30. On this occasion the fans are either new to the song or transfixed by the quality and arrangement because a sea of cigarette lighters or hand waves would be appropriate crowd interaction at this point. “Slang” went down better than expected but as a famous football commentator once said, “It’s a game of 2 halves”. This was a show of 2 halves and it’s ironic that as the stools and acoustic guitars came out to add new colour and dimension to the audio and visual show, it was also time for the best piece of Joe and the crowd banter of the night. Elliot, a staunch Sheffield United fan is singled out by a fan wearing Sheffield Wednesday FC merchandise. Joe finally takes up the challenge: “You can put that down for a start” The Owls fan, obviously quick to grab their 2 seconds of fame wants everyone to see the blue and white attire Joe unleashes what would have been a technical knock out in boxing with “You ain’t got a lot to cheer about this year darlin’” referring to the fact that his United team are currently riding high in the league and Wednesday are on the verge of relegation. It all adds to the occasion, as this stuff is an every day occurrence in the Sheffield pubs. Joe then explains that it all started for him 24 years ago and that after seeing Marc Bolan (T Rex) on Top of The Pops (British pop music show) he knew what he wanted to do. After requesting every one joins in on he chorus they break into “Two Steps Behind”, a song from the album Retroactive, one of the best songs on the night. Once again, a clean sound and great vocals all round. It’s a testament to their ability as songwriters and performers. Seeing Joe with a guitar on is nothing new these days but he’s a very good player and time keeper, many used to say Leppard live was all sampled vocal arrangements, a myth they have certainly put to bed. From the depths of a blackened stage a sequencer fires out the intro to “Women”. Talk about over the top loud, by the time Rick Allen came in you had no chance of hearing what Elliot was singing. Thankfully most would know the songs as this was where the show went into over drive. “Rock it” , “Armageddon It”, Pyromania”, “Animal” - the songs that catapulted Leppard into a stadium band are bouncing off the walls in Sheffield like a Squash ball . The atmosphere is fever pitch and Leppard are back with a bang. Two other points worth mentioning are the arrival of Frank Noon on to the drum riser. (The original Leppard drummer who played on the infamous EP) He seemed to be the official photographer tonight and takes a shot of Leppard with all their adoring fans, arms aloft. No doubt it will be appearing in many magazines in the days and years ahead and as if to say in 2003 Def Leppard or still attracting major audiences. However, after a repeat of the honorary Yorshireman lines, (see www.baileybrothers.co.uk previous Def Leppard review) Joe introduces Rick Allen to the audience. To say he got a great response would be an understatement. Allen got everything he deserved a standing ovation that shocked him and the whole band with Elliot having to pause at the mic to allow it to continue. As someone who was at Rick Allen’s home shortly after the accident that took his arm off, we were also joining in with the applause. The way this guy has adapted his playing is nothing short of genius and it was one of the highlights of the show to see him perform.